It’s not even out in the West, but someone has already turned in a Dark Souls 3 speedrun that sees the credits roll in under two hours. Will the FromSoftware sequel end up making its way onto our list of PC’s best RPGs? To be exact, this speedrum clocks a total of one hour, 42 minutes and 10 seconds. Word on the street is, Dark Souls 3 is actually not a two hour game, believe it or not. In fact, you can expect to spend dozens of hours dying and trying in its grim, hostile world. If you wanted to get anywhere near this completion time, you’d need beyond intimate knowledge of the game: shortcuts, boss weaknesses, item placement, and more. That’s what makes the video so mesmerising to watch. You can see what’s happening and you know it’s probably a really tough, long game, but this person is somehow making it all seem trivial. 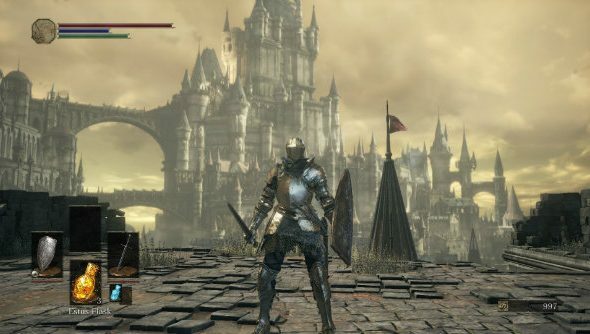 It makes me feel as inadequate as Dark Souls Onebros do – these people have fought their way through the FromSoftware original without even leveling up. Then there are the people who beat it with a pretend instrument. Honestly, why do I bother? It’s early days for Dark Souls 3 speedruns, but this one currently sits just behind the shortest registered glitch-free runs for Dark Souls and Dark Souls 2, both of which were finished within an hour. Expect faster times once Dark Souls 3 is out internationally on April 12.